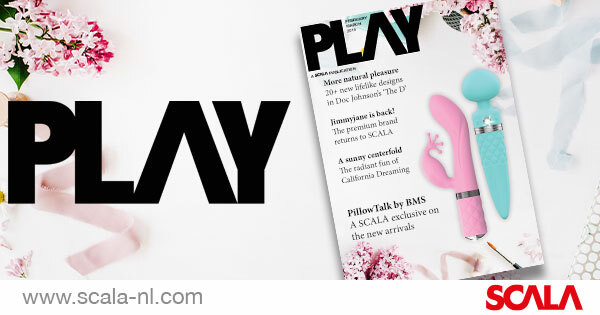 The February/March Edition of PLAY Magazine is now out! SCALA customers will receive a copy bundled with EAN Magazine this month, but can also download a digital version now for instant access to all editorials, product news and more. What to expect? Well, part of the February/Match issue of PLAY is filled with some very exclusive arrivals. At SCALA, we want to go the extra mile for our customers, offering them something special, something other distributors can’t. We are, therefore, thrilled to announce the arrival of new PillowTalk products, a Pocket PalmPower stimulator, and 2 beautiful new Swan Mini pleasure providers. These BMS products are fully exclusive to SCALA customers for the first 6 months after release and feature prominently in PLAY. And the exclusive PLAY fun doesn’t stop there! We’ve included a sunny California Dreaming Centerfold, highlighting the newest designs in this vivid collection by CalExotics: also exclusively available at SCALA. Other editorials include an in-depth story on Jimmyjane, now back at SCALA in full-force. A JoyDivision Anniversary Favorites page. And a fantastic ‘up-sell drugstore and toys’ special.